The tete d'expression was the brain child of the antiquary Anne Claude de Tubieres, Comte de Caylus (1692-1765). In 1759 he set up a trust allowing for a competition in which young artists vied with each other for a prize distributed by the Academie. The tradition had its roots in the expressive heads of Poussin and in the Confirences sur l'expression of Charles Le Brun (illus. ed. published in 1718). Eighteenth - century French artists, also sought inspiration in the works of Italian and Flemish painters of the Renaissance and Baroque periods. Among contemporary painters who successfully cultivated the genre was Greuze; in this respect he must be counted as a major influence on Vigee Le Brun, who copied a number of heads by him. 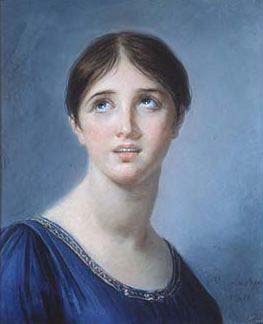 In her youth, the vogue for these heads was phenomenal, and she exploited it verv early in her career. Tetes d'expression'or tetes de caractere by her were to be found in major collections. Many of her clients wished to be painted in attitudes resembling Saint Catherines or Saint Cecilias, with their heads raised, their lips parted, their eyes turned upwards in ecstatic rapture. The histrionic portraits of Mme Grand ( cat. no. 12), Lady Hamilton as a Sibyl ( cat. no. 36) conform to this mode. This beautiful and heretofore unpublished pastel, painted when the artist was fifty-six years old, has marked affinities with the bust-length Vestal Crowned with Roses of 1778, work formerly in the Munier-jolain collection, where it was erroneously considered to be a self-portrait (illus. in Blum, 1919, facing p. 72). PROVENANCE: Anonymous sale, a Paris, Hotel Drouot, December 9, 1968, lot 31 (as School of Vigee Le Brun).